I present, for your delectation, just a single miniature this morning, but what a fearsome lump of lead! If truth be told, I've been putting off working on Mr. Sickle for a while now, as not only is it a considerably larger model from the 'Knight Model' stable, but acres of rippling muscle are not my favourite thing to paint simply because there is nowhere to hide. A bizarre abominiation, legend has it that Mr. Sickle was one half of a conjoined twin performing in a Russian circus with his brother Mr. Hammer. Their brutality brought them to the attention of the Joker, but only needing a 'right hand man', the clown persuaded them to be separated before callously discarding Mr. Sickle. Now a Lieutenant in the Penguin's crew, Mr. Sickle has come a long way from the small Siberian village of his birth. 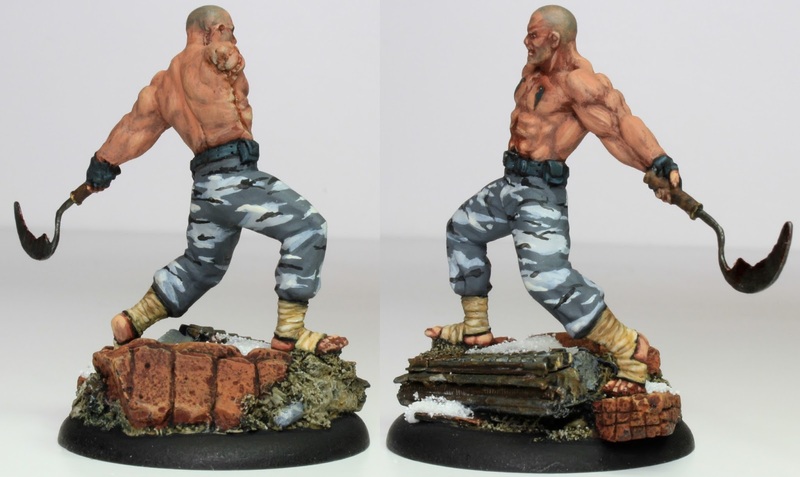 Fortunately, for yours truly, a relatively simple miniature to put together with just his sickle hand requiring a pin, again based on an 'Element Games' resin 'old factory' base. * Having made a rod for my own back with the camouflage trousers used on the other crew members, this detail clearly needed to be carried through here with the addition of some tattoos to represent his affiliation. A formidable addition to the crew, Mr. Sickle will surely have the Batman running for the shadows? *albeit a much larger one at 40mm. Truly fabulous. That is one excellent model. Thank you Clint, of course being a little larger than usual it was easier on the eyes. I have just checked to make sure "Mr Sickle" is not a Roger Hargreaves character. Nor is "little Miss Lecherous!" He is a great looking model although I will say that the right side of his face seemed a little miscast, I might just have been unlucky but if you get the chance check before you buy. Wow. You've done a brilliant job on him...looks superb! Thank you so much Gordon, that is very kind of you. Not sure about on top of my game, but I am certainly enjoying the summer holidays and being able to take my time over the miniatures. Thank you nonetheless for the kind words, they are greatly appreciated. Stunning looking model and i love the camo pants! Thank you and yes, I am pretty pleased with especially the face. Excellent painting Mr A! A fearsome figure indeed! Thank you Rodger, he is quite a beastie. Thank you Roy and I used Vallejo Model Colour, Basalt Grey. Start with a very watered down layer just to work out where you want it to go and then apply more as required - best of luck. Thank you. I'll buy some and give it a try. An interesting figure and very well done! Thank you András, that is very kind of you. Fabulous artwork! This is a truly impressive miniature, congratulations! Thank you so much, I was really please with how he came out. Thank you so much Nick, that is very kind of you to say so. Outstanding, Michael. Not "your favorite thing to paint" perhaps, but the muscly bits look great. Thank you Mr. Finch, it just wasn't working at first and I found myself getting quite frustrated, but perseverance was the key. Great mini and wonderful painting job! Thank you Luca, I was really pleased with this one. My abject apologies Kieron, they are very tempting aren't they? I have already had to remind myself that I already have a number of unfinished projects on the go! Excellant paintwork Sir - brilliant base too. Thank you Dan, the bases are a bit of an extravagance, but having started I wanted to carry them through. Excellent work from the skin tone to the buzz cut hair, perfect work sir! Thank you so much Ian, this was a challenge, but really pleased with the outcome. Very nice mate, if that make sense given the subject matter. The stubble is spot on and the camo is very convincing indeed! Thank you so much Millsy, I am certainly enjoying this distraction, but acutely aware that there are other projects that need my attention. Scary looking character, Michael. The camo work is superb too. Thank you Dean, looking forward to seeing if he is as mean as he looks on the table. As always great job Michael . Great work. Your camouflage technique is a true winner. Thank you so much Jay, it s starting to become easier to master. So the key to Knight Models is finding on armed figures? The skin came out nice its surprisingly difficult to do well but then this is why you are Sir Michael. He is both a majestic and scary. Thank you Robert, that is very kind of you, but I am relieved to have him off the table as it was one of those miniatures that I kept staring at rather than painting. Great job again! Interesting character and certainly something different as a sculpt. Thank you, he is certainly a bit different and considerably larger than anything else that I've done recently. Excellent painting! Love the skin tones – very nicely done. Wonderful paintjob on the large boy. He and his brother are featured in the recent Batman comic 'Arkham Knight' which covers the time between the video games 'Arkham City' and 'Arkham Knight'. Not one of the best Batman comics I suppose but rather entertaining anyway. Lovely paint work. I do love Knight models...but the price tag here in the states for a single figure is crazy!